Dr. Homer A. Kent, Jr. (left) this morning donated a copy of his newest book “Studies in Mark: The Beginning of the Gospel of Jesus Christ” to Bill Darr, head librarian at Grace College and Seminary. The Mark book, the first in the new Kent Collection being published by BMH Books, is a newly-rewritten and expanded version of Dr. Kent’s teaching notes from his 50-year career teaching Greek and New Testament. 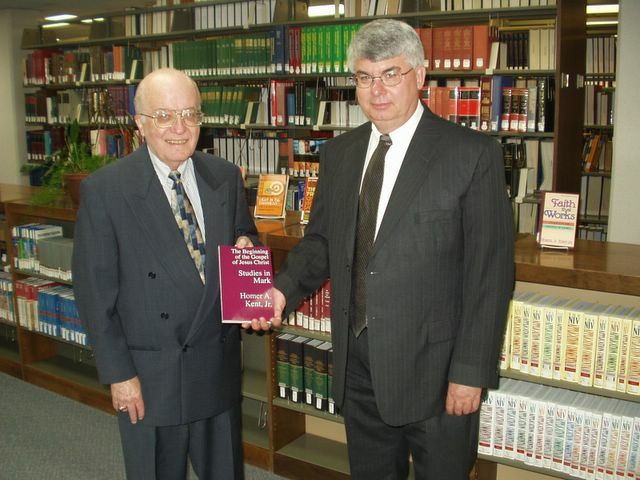 Dr. Kent was also president of Grace College and Seminary for ten years, and the Grace library now has a complete collection of his writings. The 248-page paperback Mark commentary is available for $14.99 at www.bmhbooks.com or by calling (tollfree) 1-800-348-2756. Large-quantity discounts are available for churches and individuals wishing to use the book as a text for courses, ABF and Sunday School classes, or for small-group study use. Contact BMH Books division manager John Leonard at the 800 number for details.